A beggar approached us for alms while we were engrossed in a serious discussion on food security for the urban poor near a government hospital in Madurai, Tamil Nadu. We gave him Rs 5 and were intrigued to see him buy a filling lunch from the paltry amount. First he bought a vada from a pushcart vendor and then entered Amma Canteen, located in front of the hospital, to buy a plate of curd rice for Rs 3. The incident made us realise the potential of such canteens in feeding the urban poor. The Amma Unavagam scheme, under which the canteens operate, was launched in February 2013 by Tamil Nadu Chief Minister J Jayalalithaa. Today, in Chennai alone there are over 400 Amma Canteens. Every day, the canteens prepare 0.43 million idlis and 0.12 million pongals for breakfast; 0.25 million plates of sambar-rice and 0.11 million plates of curd rice for lunch; and 60,000 chapattis for dinner. The scheme has attracted widespread attention. 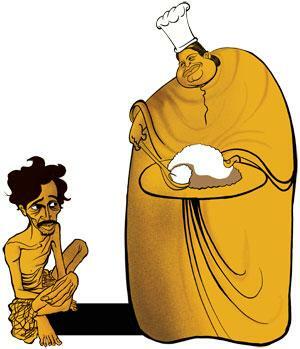 Andhra Pradesh has announced the launch of Anna NTR Canteen, a scheme to provide subsidised food to daily wage workers, in June this year. The Madhya Pradesh government too is mulling over a similar idea. Even teams from countries like Egypt and Korea have visited Tamil Nadu to study the initiative. The scheme is not the first of its kind in the state. In the 1950s, Sarojini Varadappan, daughter of former chief minister M Bhaktavatsalam, started the Annapurna Cafeterias to feed the urban poor in Madras (now Chennai). Efforts of K Kamaraj, former chief minister, to encourage primary education did not bear much result till the Mid-Day Meal Scheme was launched to provide food to children. Later, M G Ramachandran, another former chief minister, refined and expanded the scheme as Noon Meal Scheme. The Amma Unavagam scheme directly fights urban malnutrition and hunger. Food is provided at rates that are considerably lower than the rates charged by pushcart vendors. Moreover, the food is prepared and served in hygienic environments. The plates are washed with hot water to keep them clean. Officials inspect the canteens twice or thrice every month. The floors and walls of many canteens are tiled with polished stones. Migrant labourers from states such as Odisha and Bihar say they are regular customers of Amma Canteens because the prices are reasonable. Apart from the urban poor, the canteens have also gained popularity among IT professionals working in Chennai, who say that the food is of good quality. In fact, people from different walks of life, belonging to different social strata, even tourists, say that the canteens serve good quality food at throwaway prices. Workers at the canteens in Madurai and Chennai say that there is demand from the public to increase food items and the running hours of the canteen. The scheme also provides employment opportunity to women living below the poverty line, who form the majority of the workforce. The workers are selected by community organisers (who are a part of the municipal corporation) with the help of the ward councillor and are members of self-help groups (SHGs). Each canteen employs between 12 and 16 women. Thousands of women are working in these canteens in the state and get a monthly wage of around Rs 7,500. The wages are paid through cheques issued by the municipality in the name of the SHG the employee belongs to within first 10 days of the month. The Amma Canteens are supposed to run on a no-profit- no-loss basis. However, a look at the finances reveals that the canteens are incurring heavy losses. But this is expected in any welfare scheme in India. However, the government needs to be more transparent about the financial details of the scheme, which will help reveal its accurate cost-benefit ratio. Though the scheme has greatly benefitted the urban poor, some argue that it has severely affected pushcart vendors. A good number of these vendors are trying to adapt by preparing samosa/kachori and other items that are used as a side-dish by the customers of Amma Canteens. Some have started preparing non-vegetarian items like omelette, while some have shifted to localities that do not have Amma Canteens. Overall, the social benefits of the initiative outweigh the economic costs. Though the scheme appears to be highly subsidised, efforts must be made to make it more sustainable. It must also be expanded to more areas. The variety and quantity of food items should be increased to meet the preference of the customers. According to the latest Food and Agriculture Organization report, “The State of Food Insecurity in the World 2015”, about 194.6 million people go hungry every day in India. As India increasingly urbanises, the number of poor labourers is only going to increase. Only state-sponsored food subsidy schemes like Amma Unavagam can go a long way in overcoming hunger and malnutrition in urban areas of the country.